Achieve a professional finish on your project with our range of clay ridge and hip tiles. Purposely designed to protect potential weak spots in your roof space whilst also adding to the beautiful aesthetic of clay roof tiles. 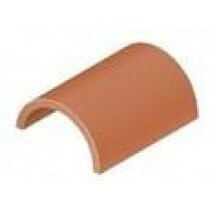 Our range of clay ridge tiles include those manufactured by leading brands. The same can be said for our clay hip tiles. Each are crafted from the highest quality clay and are available in a variety of colours. This allows you to achieve a consistent finish on your roofing project. With a variety of colours and finishes available, our selection of clay ridge tiles are the perfect complement to your new roof tiles. Their curved design is able to suit both rural and urban properties, whatever their age. Have More Questions About Our Clay Flashings? If you have questions about our range of clay ridge and hip tiles, speak to our team online or by telephone. With over 40 years of experience in roofing, we’ll help answer your questions about our clay roofing systems. We will also help you pick the best tiles to match.